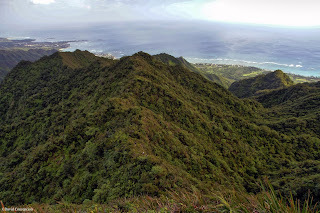 Like NFL players driving the chains down 100 yards of gridiron, I am moving my virtual chains slowly but surely down the roughly 50 mile summit spine of the Ko`olau Mountain Range. 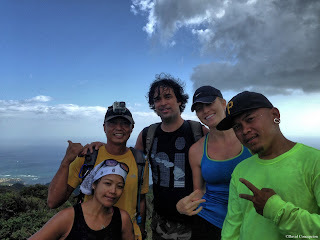 One day before my 29th Birthday, I, along with Gerwin, Thessa, and Jose, would complete the segment of the Ko`olau Summit Trail between the termini of Castle Trail and the trail leading down Pauao Ridge from the summit back into Kahana Valley where we would conclude the hike. We couldn't have asked for better weather for this excursion. 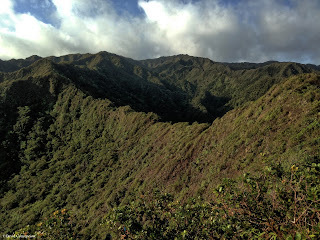 Although a Kona storm would bear down on us the very moment we would conclude this hike, some 18 and a half hours later, it seemed like mother nature would hold off her wrath as long as she could, until we were down safely. The time was 4am when we all met up at Valley Temple McDonalds. John and Amber would join us but only for the 1st leg up Papali Ridge to the junction of Castle and back down the same way. 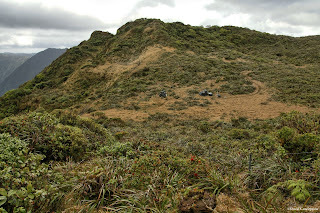 Once our cars were staged, we set off on the long roller coasting trail of Ma`akua / Papali Ridge. The last time I was on this trail was with Leslie Merrell on July 17, 2010. On that day, we reached the Castle junction and headed down the switchbacks back down into Punalu`u Valley. Today, we were to reach for the same junction but continue onward on Castle to reach the KST. Once at the trailhead of the Ma`akua Ridge, we dropped down to a streambed and picked up some switchbacks on the other side. 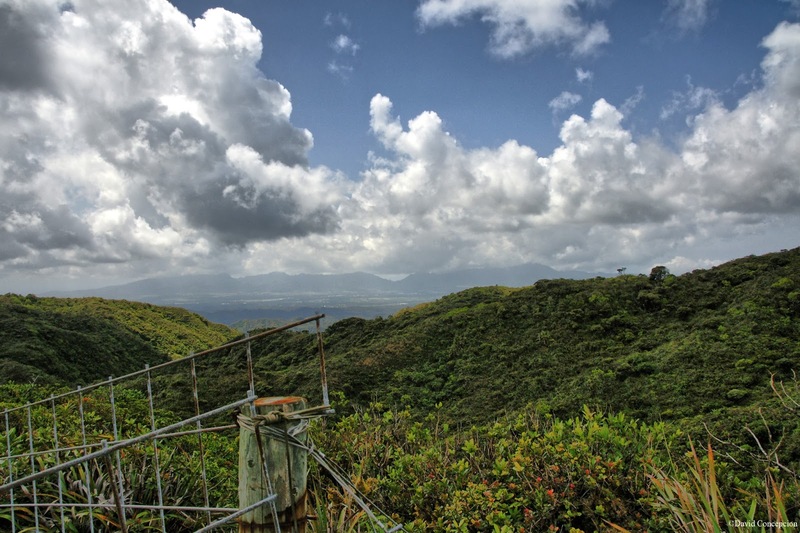 A wonderful lookout of Hau'ula with two benches and a covered picnic table can be had. 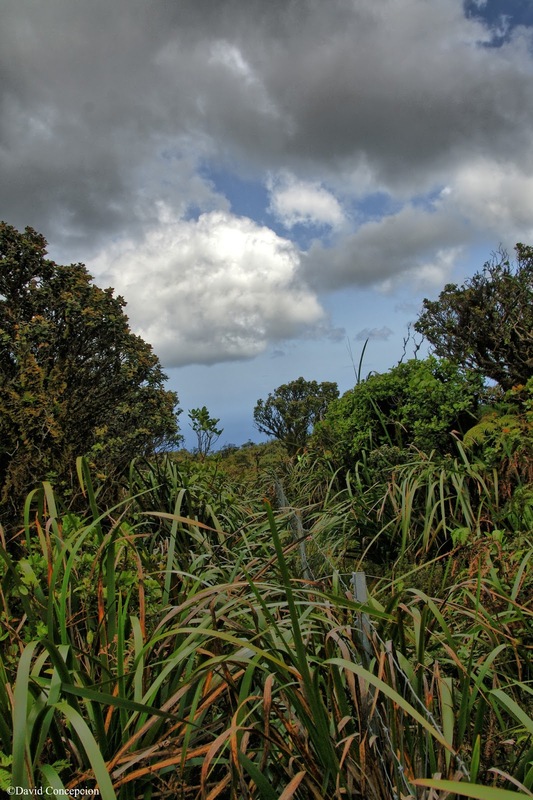 The trail then goes mauka up to a junction. 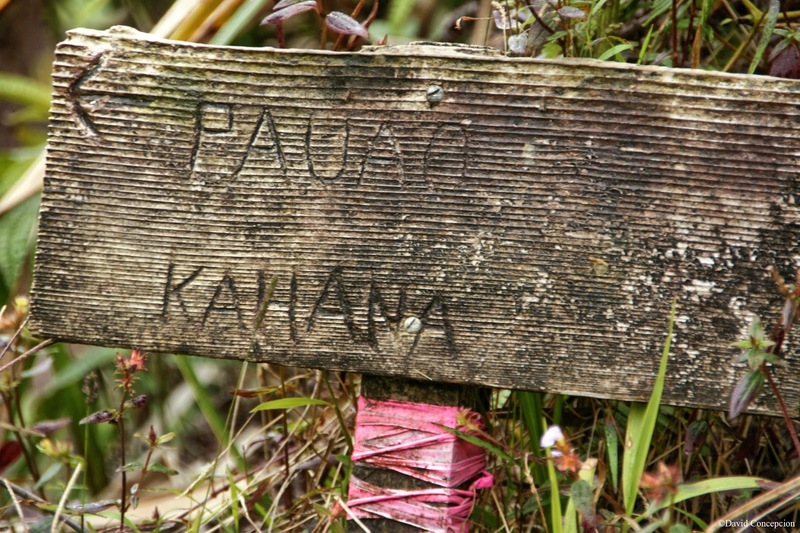 Taking the left fork drops you down into Papali Gulch and is the return leg of the Hau'ula Loop Trail. The right fork takes you up the Papali Ridge Trail and eventually to the Castle junction. The trail remains pleasantly wide at this point but not for long. The trail quickly deteriorates into an uluhe choked footpath and the roller coaster action begins. This continues up for the next 3 to 4 miles until a pu'u with a commanding view of Hau`ula and as far as the Kahuku windmills. 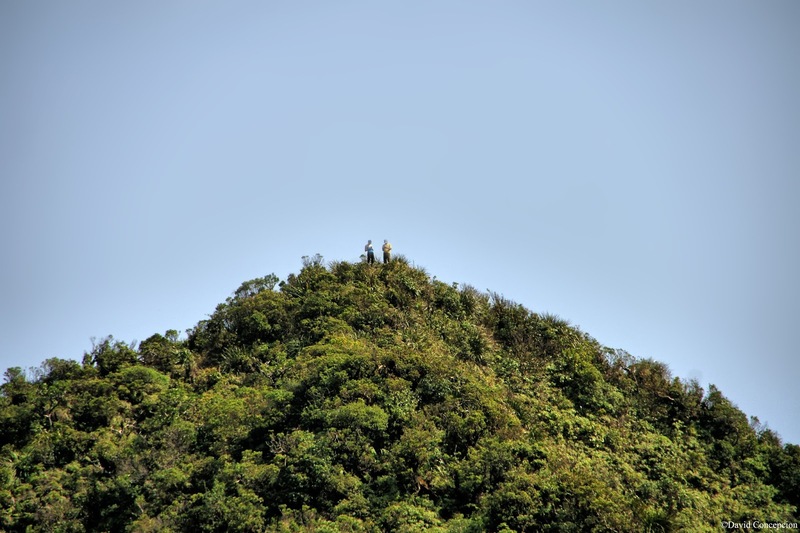 Due to an appointment later in the day, John and Amber would turn around and head back down. 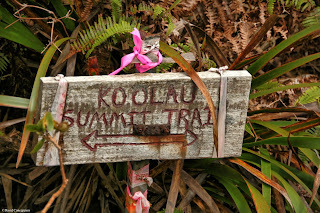 After saying our goodbyes, the 4 of us continued ahead to an ominous hill that looked very steep, but the trail contours on it's right and before we knew it, we spotted an old green sign marking the Papali / Castle junction. Turning left goes down Castle so we went right and onwards towards the summit. 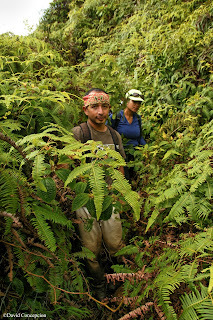 We were relieved that the trail was nicely graded, unlike the ungraded Papali Trail. 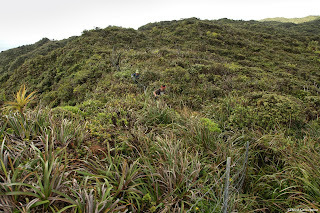 I've read articles that the summit was about an hour away from this junction, but the trail was pretty overgrown and eroded on some spots that it took longer than that. As the trail contoured to the right of the ridge, we got a nice view of the entire Papali Ridge and even spotted John and Amber, still on top of the large pu'u. 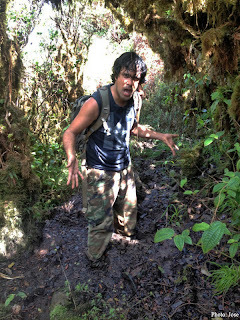 The trail became riddled with mud holes up to just above our ankles. 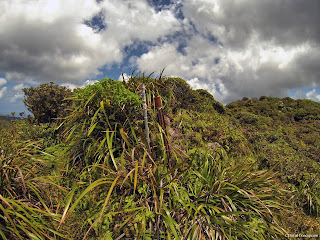 Sometime later, we came to an unknown junction, marked with some blue ribbons. I associate blue ribbons with the KST so I was confused if we were on the KST already or if this was still Castle. 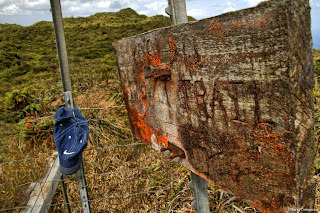 Gerwin scouted the left trail while I scouted the right. 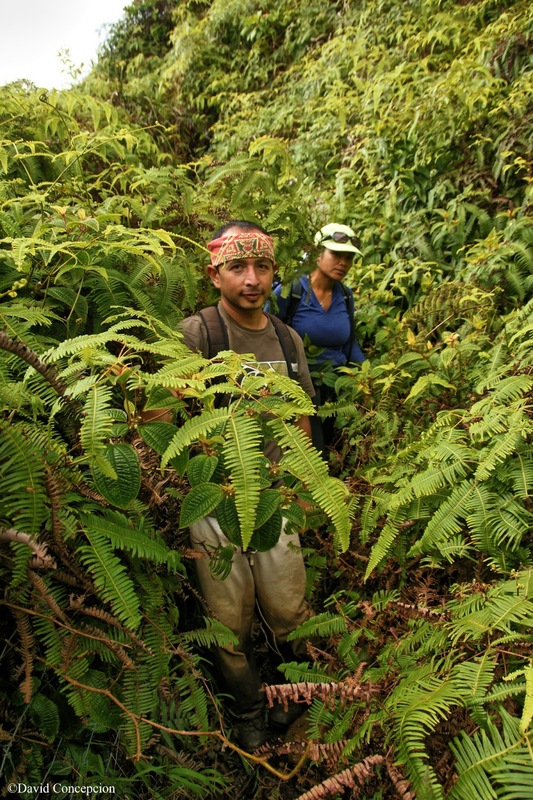 A minute later and Gerwin called out that the left trail dead ends at a splendid waterfall lookout. We soon resumed on the right fork. 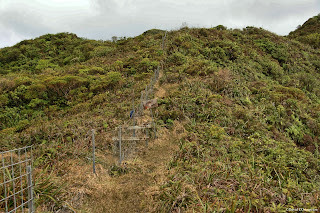 Further up, we've encountered another side trail off to the left that heads up to a windswept hill. But this is a false summit. Again we continued straight ahead. We then came across a huge bowl shaped meadow like area and I was convinced the KST was just on the other side on the top. It turns out that the final quarter mile of Castle Trail would actually circumnavigate this meadow as it veered leftwards to acquired the small grassy terminus of Castle Trail, marked by a very rusty stake and a plastic PVC pipe. This also marks the junction with the Ko`olau Summit Trail. 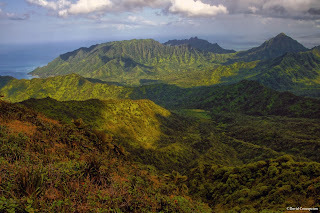 From here, one can head north towards La`ie or south towards Poamoho. 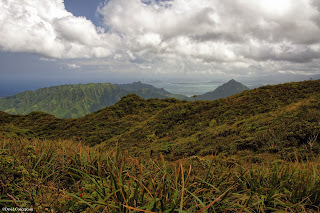 Looking leeward, we had a commanding view of the entire Wai`anae Mountain Range. 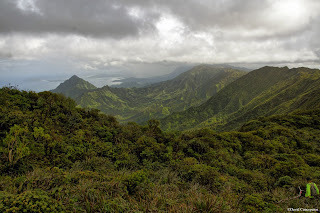 We began the long haul on the KST towards Poamoho, but because of access issues on would be an easy 3 mile hike down Poamoho Trail with a permit and a 4x4 vehicle, we had to make due with a very steep descent down Pauao Ridge, a windward ridge recently cleared last year. We ended up coming upon that same bowl shaped meadow again, confirming my spectulation earlier. 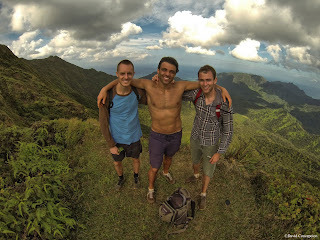 I got a text from John, saying Coty and Marvin were on their way up Papali Ridge. Wonder if they were going to follow us (would find out later that they only went up Papali and down Castle Trail). Continuing on, we encountered a fence, which would remain with us for just about the remainder of the hike as it follows the KST. Had the fence not been present, we would be virtually hiking in an ocean of windswept green with a view of the ocean to the windward and central O`ahu with the Wai`anaes to the leeward. 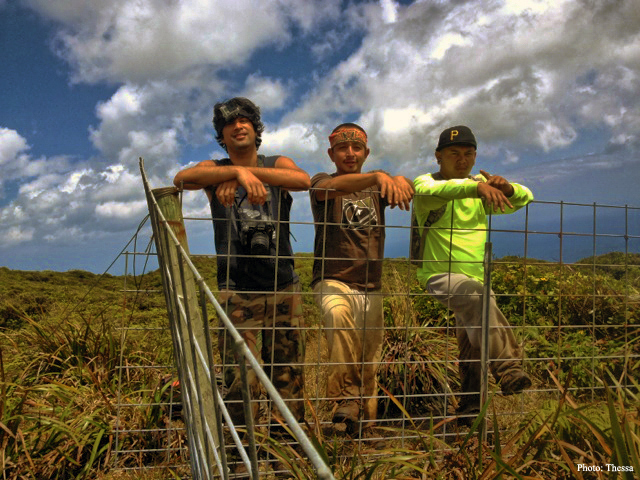 In a way, the fence helped us with navigation. 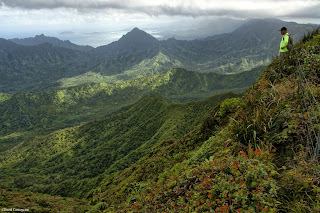 Looking southward, we could see the very tip of the ridge line overlooking Ka`a`awa Valley and the Kualoa Ranch. 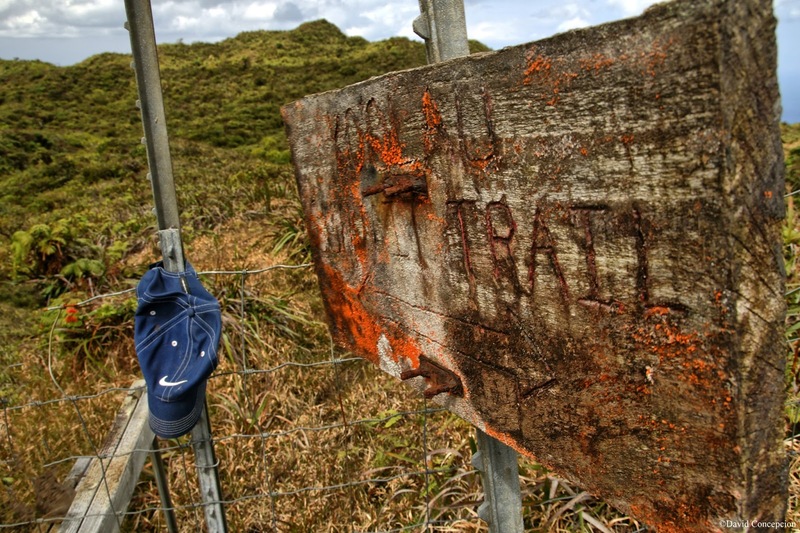 After a short break in the fence, we came across a sign that read "Ko`olau Summit Trail". The fence continues beyond that. Off in the distance, I could see the views beginning to open up and fill my field of view. We were about to cross over to the rim of the Ko`olau pali. If you've watched the previews at the movie theaters over the summer last year (2012), there was one particular preview that began with cramming the viewable area into an area roughly the size of your television and playing the audio in a monotone fashion while the rest of the movie screen remained shrouded. Then as the preview went on, the viewable area expanded. Then with a final and spectacular "BOOM!!!! ", an explosion filled the entire movie screen and the audio became the well known Dolby FX. Yeah, that was exactly what this hike was. A monotone like hike with a spectacular BOOM to incredible vistas that stimulated the five senses. The fence would continue along the edge of the pali, along with the KST, returning the Ko`olau summit walking experience to the one that I'm all too familiar with with past summit walks. It was truly epic! I could feel the energy flowing through me. Perhaps it was da mana! I could see the entire Ko`olau Range all the way to Makapu'u. 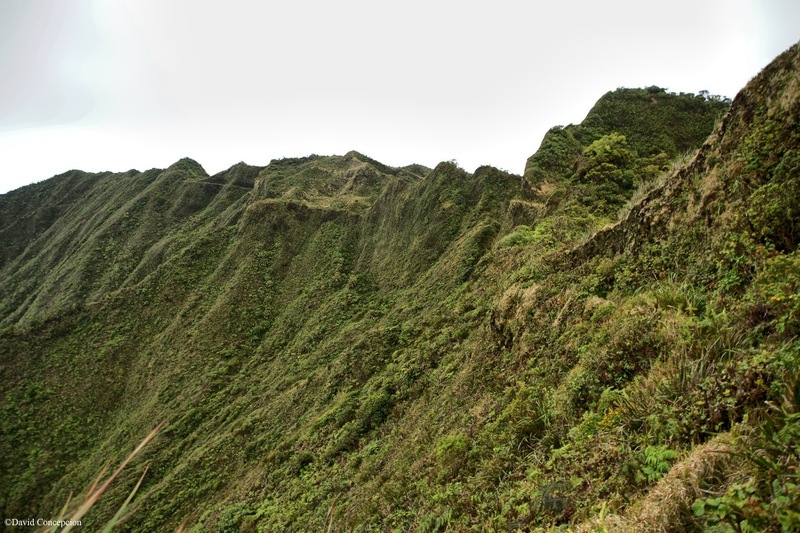 Did I really segment hike all of that? It only took three years and is still in the making. Looking up ahead, we came across another large meadow with new fencing supplies stacked in the middle of it. 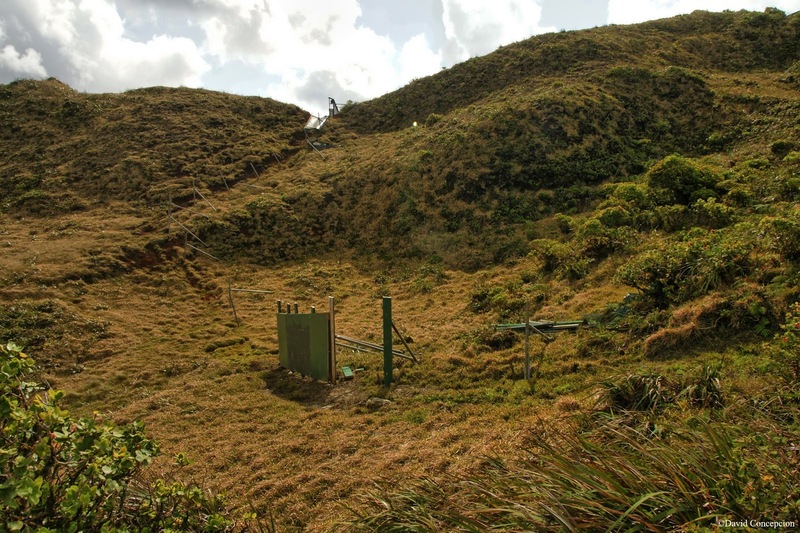 Looks like they are still expanding the fencing network. We continued to follow the fence but it terminates to the windward pali. So we hopped the fence and cut across the meadow to the other side and hopped that side of the fence. We came to another sign, confirming the KST and on we went. 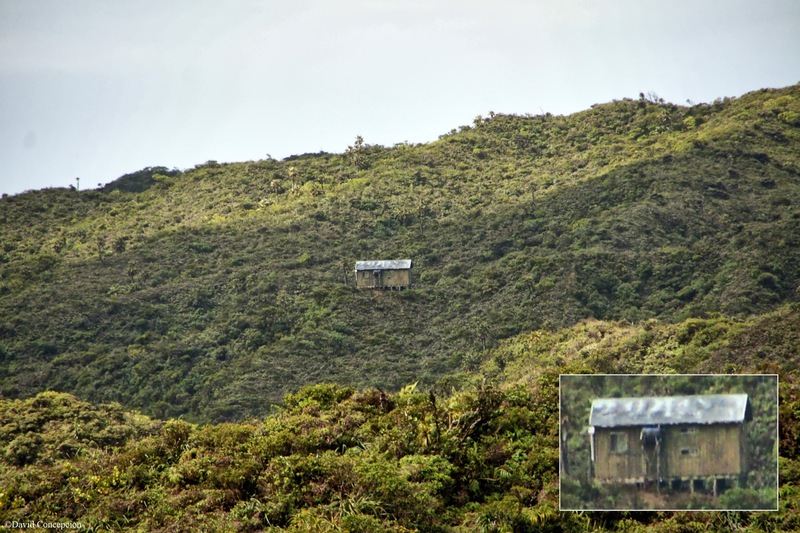 Looking back towards the north, we spotted an unknown cabin that is tucked away rather far from the KST. If you want complete isolation from the rest of the world, but want a cozy cabin, this is your cabin of choice! 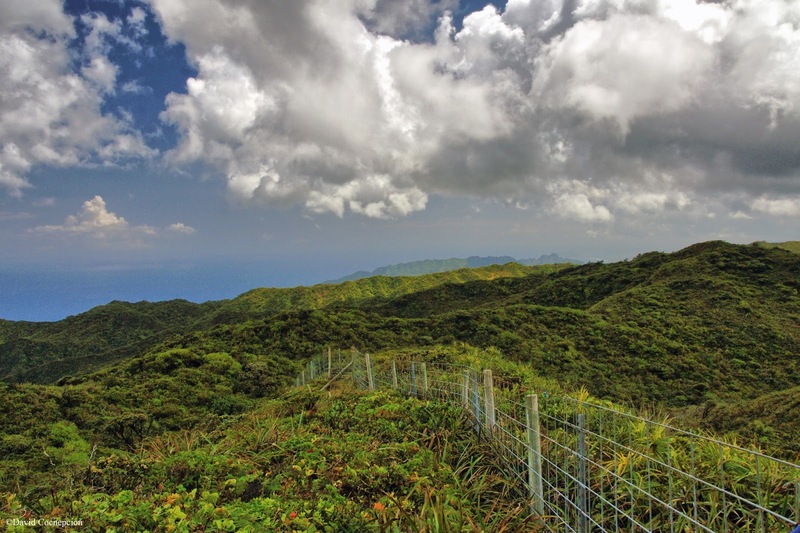 The fence continues on but when the trail begins to contour to the windward around a large hill, the fence veers off to the right and that would be the last of it. The uluhe returned briefly but I could feel that we were fast approaching Poamoho. 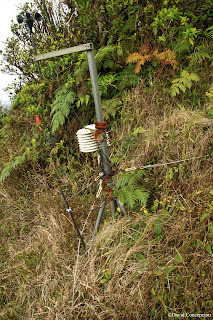 During the windward contour, we ran across some kind of weather tracking station equipment, all rusty, but perhaps still functioning? 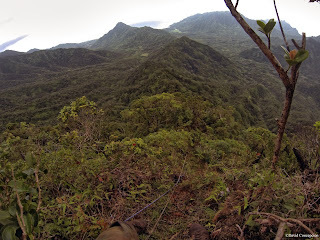 Then the Poamoho summit came into view at last! We also spotted three guys sitting there as well. Before actually reaching the grassy meadow with the Clines Memorial, we came across another small clearing with a wooden fence somewhat erected. We then reached the summit and exchanged pleasantries with the guys there. They were stoked to find out where we came from as they were surprised to see us pop into view around a bend further out on the KST. 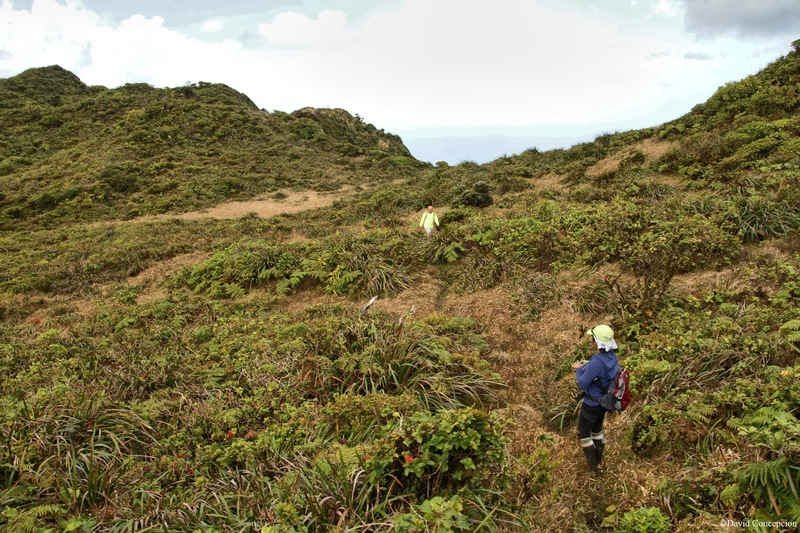 But Pauao Ridge it was and we quickly left the grassy meadow of salvation behind us. 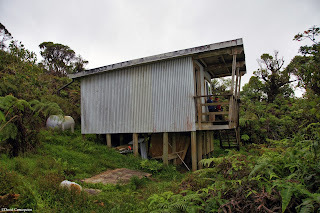 We spotted the watery marsh to leeward and then we reached the Poamoho Cabin. Exhaustion began to fill my body as I plopped my okole down on one of the bunks. Maybe we should spend the night here I thought to myself as I proceeded to sign the the logbook. But no, I slammed the logbook back onto the table after signing it, got my pack back on, and signaled the crew that this show must go onward to a proper closure. The clouds were beginning to thicken and the sky began to slightly darken to an ugly grey as the sun began to set. So on we went. I did however enjoyed this stretch of trail as it was so wide enough to ride a bike here (don't even try). 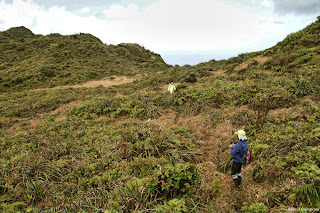 We passed by the notch cut into a side ridge and about 15-30 minutes passed when we reached the terminus of Pauao Ridge. 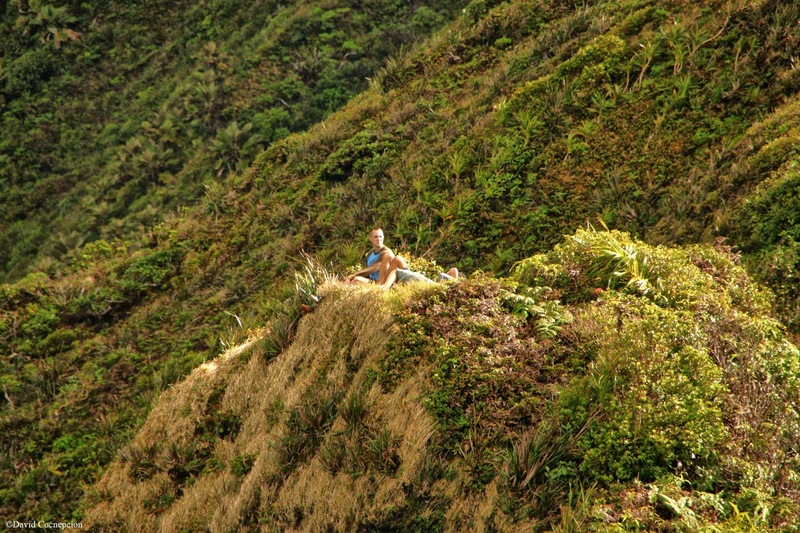 I looked downward and was not excited about climbing down this steep ridge this extremely late in the day. 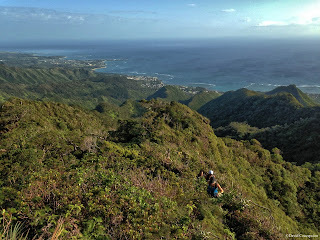 We hoped to get down to a safe elevation before dark. 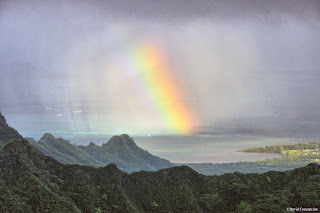 Just as we were beginning our descent, we spotted a nice rainbow over by Kane`ohe but my attention was focused downward. Down, down, down we went. 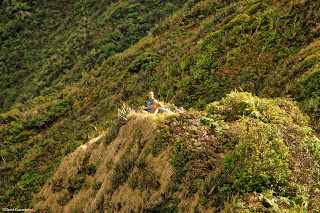 This was similiar to Waiahole Uka but not as steep. But it would be much longer as we had to deal with roller coasting action once we were level with the remainder of the ridge. 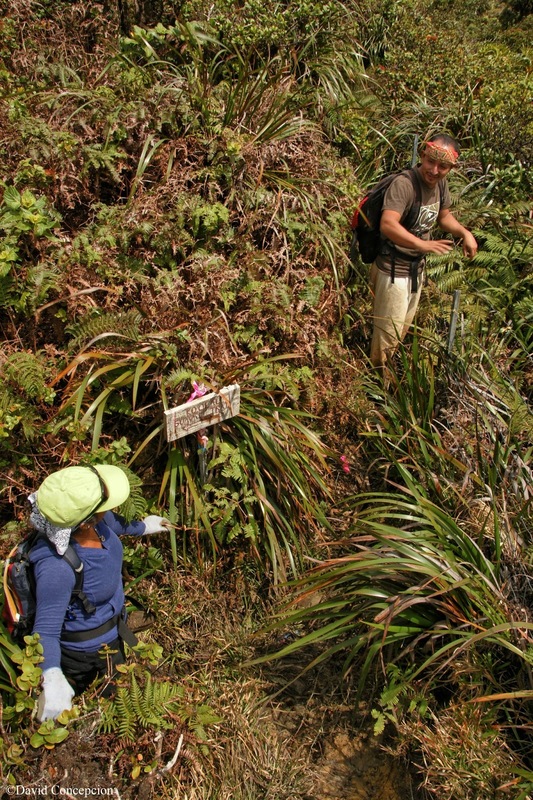 We've encountered a couple of rope sections on the steepest part, also like Waiahole Uka. We were growing tired and the sun soon went to bed. We still had a long way to go. Now in complete pitch blackness except where our headlamps lit up, we reached a relatively safe portion of the ridge line where it began to roller coast up and down. 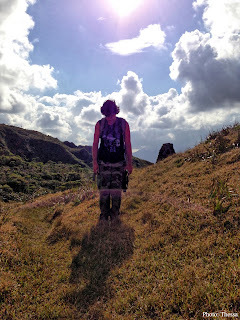 But we kept on hiking, kept on hiking. 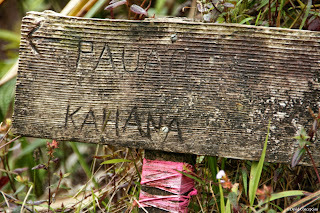 After maybe 3 or 4 pu'u the trail veered sharply to the right, taking us down into Kahana Valley. Finally! We can end this! 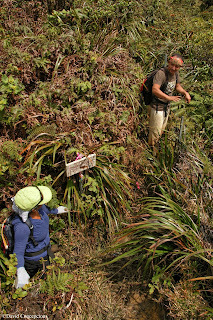 Down we continued through a sea of uluhe, using them to control our descent. If it wasn't uluhe, it would be trees. 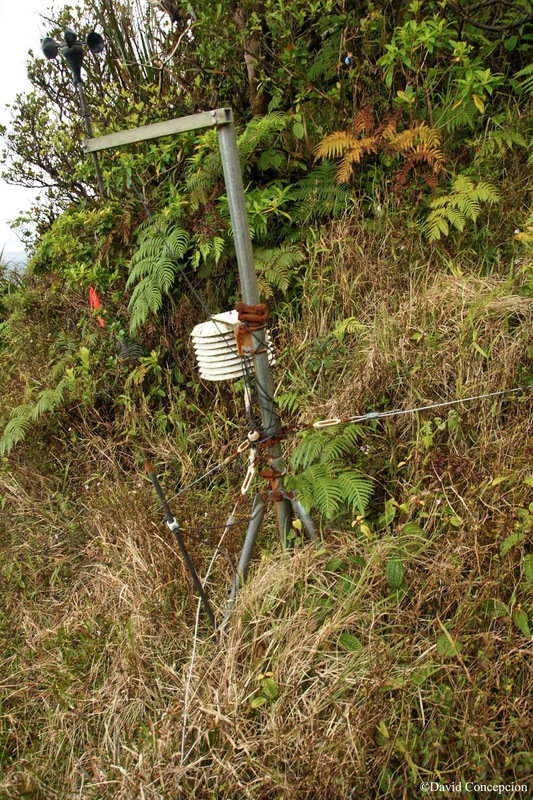 Later on, we could feel the ridge easing off in an uluhe plateau area, but it was a false indication as it dropped sharply again. But after 18 hours of hiking, we spotted the water tank and at last.... the road. I've never been so happy to be standing on solid pavement again. We did it. 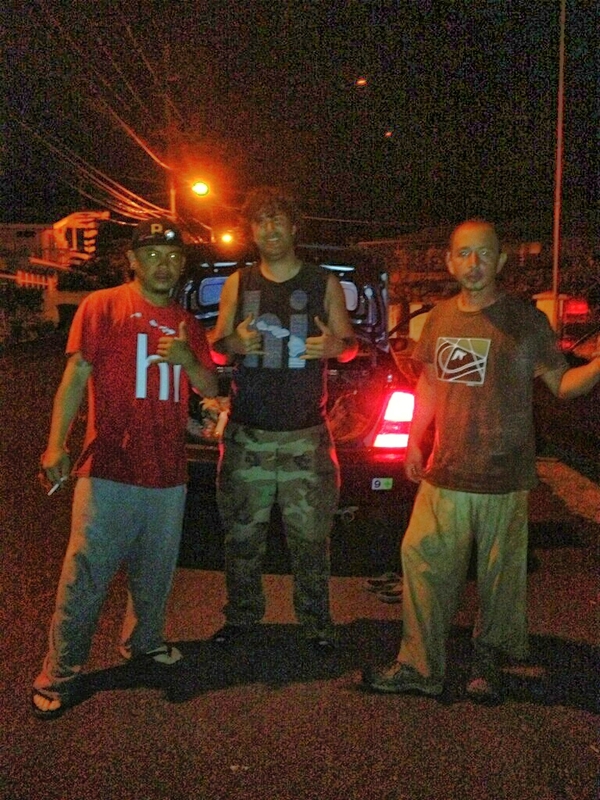 The time was around 11:30pm when we reached our cars at Kahana State Park. Once we started our drive home, the Kona Storm finally let go and dropped an inch of rain per hour at times over much of the entire island, including the Ko`olaus. She saw us finish and proceeded to dump her rain. Thessa was the one taking the photo so she was not able to be included. A few days later, my Mom would ask me, "Why do you subject yourself to these kinds of hikes?" 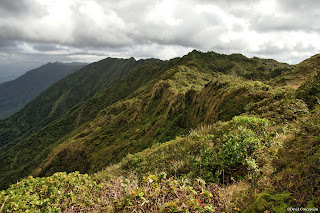 I would like to give a big mahalo to those who opened up Pauao Ridge. But it's sad to say that the trail is almost completely gone in some sections. It badly needs a trail clearing. I also want to thank John and Amber for accompanying us. Finally, I want to thank my crew who endured eighteen and a half hours of painstaking hiking, a personal record for longest day hike. What a hike indeed.